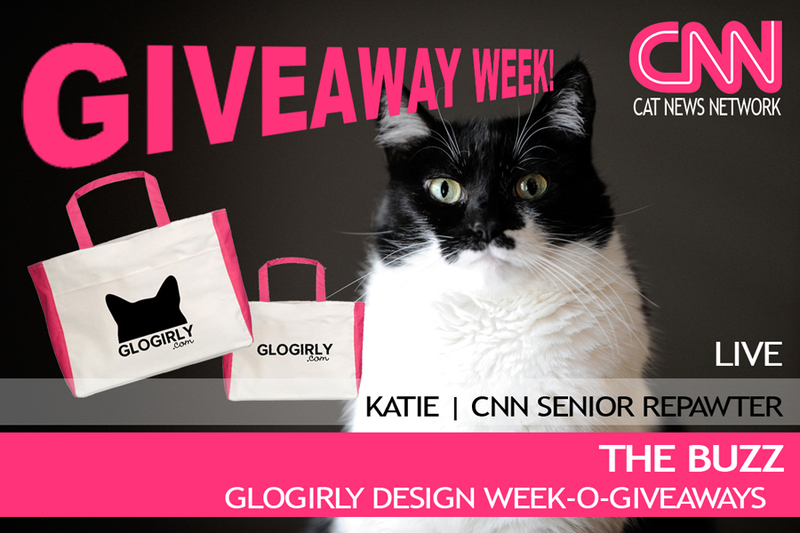 Welcome back to GLOGIRLY DESIGN'S GIVEAWAY WEEK! 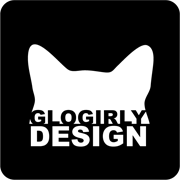 If you're just tuning in, we're celebrating the exciting launch of GLOGIRLY DESIGN, your one-stop-shop for stylish graphic and blog design, with a whole week of amazingly cool giveaways. From graphic design prizes to actual swag, this is a giveaway extravaganza you DON'T want to miss. In fact, if you slept through yesterday, you can still go BACK and enter to win Monday's fabulous prize. 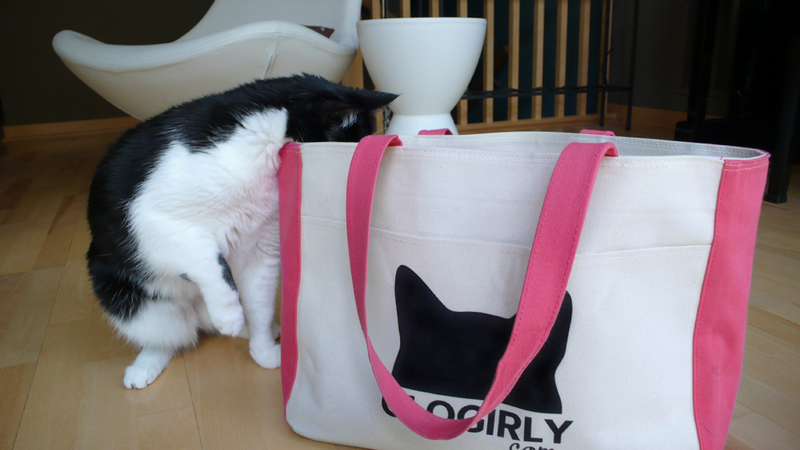 If your human was lucky enough to make it BlogPaws this year, they couldn't miss Glogirly and her signature pink tote! To say it's A-DOOR-ABLE...is an understatement. In fact Glogirly loved it so much, that she ordered an extra just for this giveaway. It's made from a heavy-duty natural colored canvas with my signature pink trim. It's very generously sized and has two interior pockets and one on the outside. It's very stiff and holds its shape beautifully. And the best part? My ears and GLOGIRLY.com are printed in jet black for all the world to see. But WAIT! There's MORE! 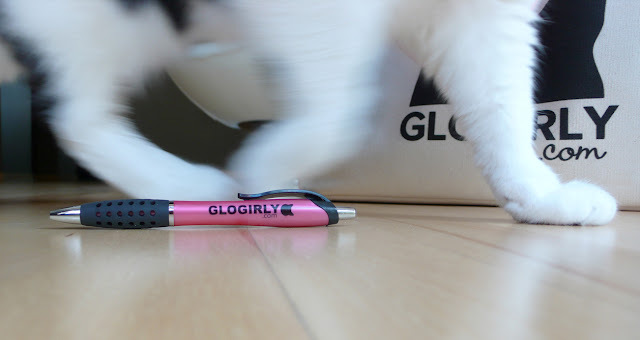 You'll also receive an equally cool GLOGIRLY.com pink pen. Don't let your human leave THIS one at the bank. 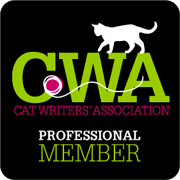 Friday - Did someone say Blog Makeover??? Leave a comment letting us know that you want to be included in today's giveaway. Make sure your email address is connected to your profile, or just leave it in the comment. YOU CAN'T WIN IF WE CAN'T EMAIL YOU. 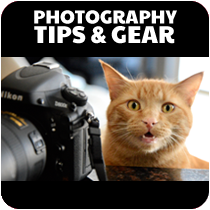 All comment entries for all giveaways must be received by 11:59 PM CST, Saturday, July 14. Winners will be determined through a random drawing. Winners will be notified via email and announced the week of July 15. You will not be disqualified for the Grand Prize if you win another prize. 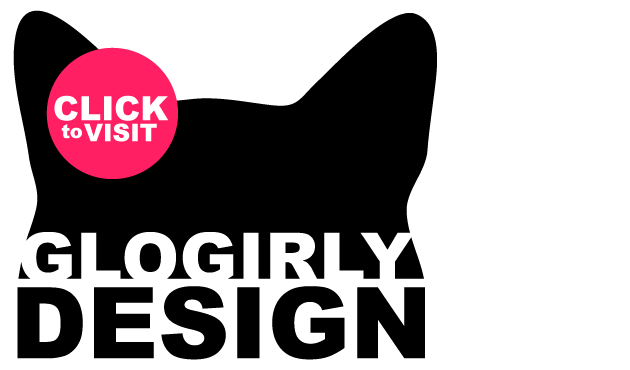 Some of this week's giveaways will be design-only prizes and some will be actual swag. Since we can't ship overseas, we are giving you TWO chances to win the design prizes! Just make sure we know where you live and we'll count you twice for the design drawings. OMC! 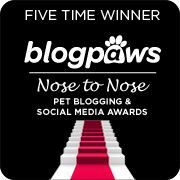 Did you know I'm a finalist for Best Blog Post in the 2012 Petties!? 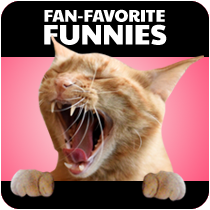 Click here to vote for me and your other favorite blogs. OMC! The Mommy just has to have it. Has to. Absolutely has to. Needs it badly. Well, you get the idea. There's nobody's head and ears she would rather carry or write with! Pee Ess - please enter us. we're at t.woodruff@hotmail.com We've already done all those things required. What kind of beautiful. I want my lady to have. Please meow. Ms. grazynamaria@op.pl mail. Everything is already done. Yours. It's really cool. Too bad I can't enter as I am not on Facebook. Oh my goodness, you should hear our mama oohing & awing over that cool bag. Just coming by to say hi and to thank you for your kind message when MoMo went to the Bridge. It's been taking me a while to get back to visiting. I couldn't bear the thought of seeing MoMo's friends and I would cry just going to check news in the CB. That's a great looking bag. Love it! Us no wanna join the Cat Giveaway. But that pen and tote bag looks wonderful. And it's pink with a kitty! It's actually kind of cool. Anyway, I dropped by to say I Petties you and that we said hi. the Momma would love,love,love this! 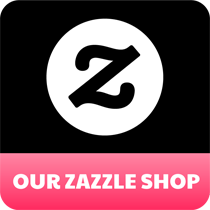 We just wanted to tell you we love the tote bag. We don't qualify to enter your drawing because we don't do Facebook, but we hope that whoever gets it takes a picture sitting inside the tote bag! Oh Mommy would love that pen and we don't think the guys would borrow it either so it would get to stay safe at home with US. The mom says she has lots of tote bags...but none of them as cool as that one, Katie! You gotta enter us in this drawing! That is a might good looking tote bag and pen. We sure would like to win that. Our email is margaretmsan@gmail.com We have liked you on Facebook. Oh wow, that IS a pawsome totebag. We hope we win one for our Mom. And that pen.....we could have lots of fun whapping it!! What a gorgeous pawsome (of course, YOU designed it) bag, Katie and so is that pen! Love, love, love it! We are fans! askfisher@gmail.com is my contact point. Squeee another fantastic prize...pink is my favourite colour!!! Those are cool! We love tote bags, and even better, tote bags with a CAT theme! Glogirly and I want you to know that if you're not on Facebook, that's OKAY!!! It's kind of a loose "suggestion" rule and we don't want ANYONE left out. 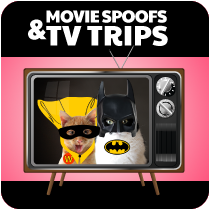 So please go ahead and enter, leave us your email in case you win and cross your paws! Love it! Please enter me. queenofpace@yahoo.com. Our loves the tote...We're just thinking of the amount of treats it would hold, when she shops for us! OMD, I mean OMC!! 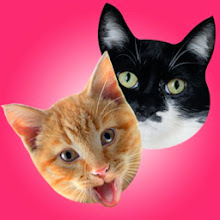 We'd love to have your ears carrying around our treats and waters and leads and coats and all sorts of stuffs.. Then they kittehs would know we don't discriminate!! Love the pen but Pop would FLIP if we brought another tote bag into the house, even tho yours is very pretty. Your giveaway is very cool. Hmmm, I think I can fit a Farm cat or two or three or four in there, can't I? I would love to win that! Another tote! Just what mama needs. She loves totes. And pockets and a pink pen! Cool! Maybe we better say, "yes, please" to entering this contest. 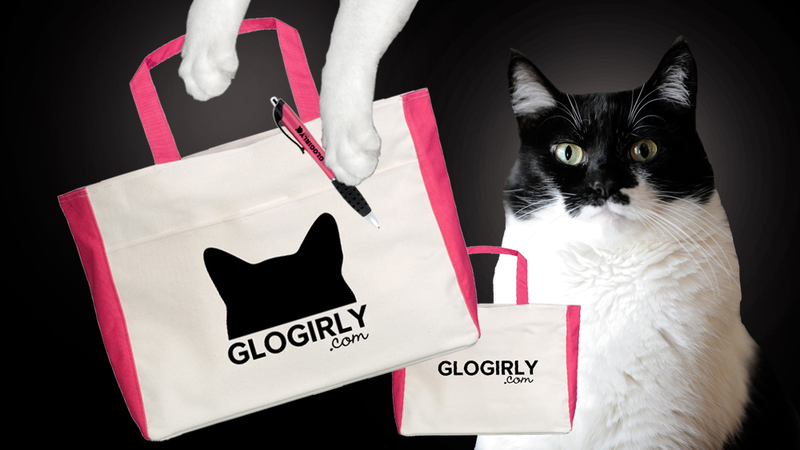 Who wouldn't want a Glogirly tote bag and pen? Please add us to the drawing! My kitty Jerry is much nicer than Mavis! Aside from the fact that I am a pen hoarder (this one looks like it could be a favorite!) I would love a tote bag with some cute black ears--just like my kitties' too! You are just the cutest! And yes I "like" you on Facebook! That is a very cool bag and pen, but M said she's got too many tote bags now and nothing to tote around anymore. Very nice of you to give a give-away. What a cool bag! I would love to win it! Would love to win a bag!! It is so cute!! But I know I live in Sweden and can´t participate in this draw. Now what cat doesn't love a good bag?!?! I would love to win that! I saw you waving at me Katie! Amy Cat would like to put her paw in for the tote bag. She thinks it would be perfect for napping in. She also asked if Katie comes with it so she can help find trouble. I told Amy Cat she's perfectly able to find trouble on her own. I, apparently, am a spoil sport. My human remembers how cool that tote bag was! Of course, if I won it, it would be MINE to hang out in, and she would not get to use it. We so hope we can win tour fab bag! The pink sides to the bag are awesome and we really love the pen too. Please enter us. (no Facebook, sorry), otherwise we would definitely "Like" you). Just wanted to say that you girls GG&K have STYLE! YOU sure do know how to put style into design. Please include us in your drawing. Lovely prizes you have! 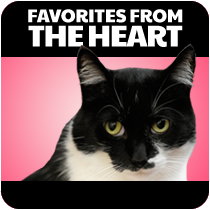 Thanks for the kind comment about our kitty pic in the header - it is sweet Georgie girl. So cool! Count us in! Next years BlogPaws is near our house, so the mom is thinking she is going to go. Please sign us up for this super cool Katie-bag! Well, duh I want a Katie and Glogirly bag and pen. 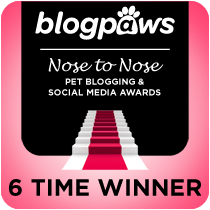 Congrats on winning the blogpaws t-shirt design contest. Yours was definitely the best! We need that bag soooooo hard we can't even tell you! The Human would be the Hit of her School if she hadded a cool bag like that!!! We're IN for this drawing! (We WOULD like you--heck, we'd LOVE you on Facebook but The Human deleted her Facebook and I have not been able to convince her to make another account. She says "Spitty your blog takes up all the time I have available for the computer. Do you want me to stop that so we can has Facebook?" And shoot, what kinda choice is THAT??? So Katie, do you come with the bag??? Now THAT would be pawsome. But love it even if you don't come with it. OMG! Now that is PURRFECT for arriving at the vet in! Mes just has to has one! Thanks for your e-mail. I would love to be entered for the tote. My e-mail is nycolopsATvlaDOTcom. We are playing catch up after our lock up! That is a lovely bag and pen. We told mum we should move to America so we could enter but she just said we are silly kitties. We liked you on FB but we are not showing in your friends list. Mum is still on the old system, she doesn't understand timeline. Her brain is getting old and she gets confused! She couldn't see where to send a friend request. Wow! Love the clean design , , , and, of course, Katie's gorgeous ears. Please enter us. Purrs.